Jason Collins gay: Why do so many people want us to know how little they care about the NBA player's coming-out story? Jason Collins’ coming out reveals a new, peculiar form of homophobia. 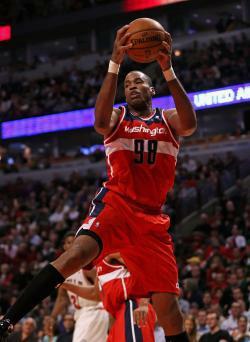 Jason Collins #98 of the Washington Wizards grabs a rebound against the Chicago Bulls at the United Center on April 17, 2013. When Jason Collins came out on Monday, a chorus of politicians, journalists, and sports fans praised the NBA player for his courage and celebrated him for making history. It’s been especially heartening to see that tolerance has outstripped bigotry even in straighter-than-thou pro locker rooms. When Miami Dolphins wide receiver Mike Wallace noted his disbelief that “guys wanna mess with other guys,” Kobe Bryant (“don’t suffocate who u r because of the ignorance of others”), LeBron James (“I think it’s a strong thing to do”), and Steve Nash (“maximum respect”) drowned out his stupidity. As Lakers forward Metta World Peace told a group of reporters, “You should be free to act and do as you want to do, as long as it’s not violent. I came here in a Cookie Monster shirt because I wanted to.” Very well said, Metta. The overwhelming support that Collins has received in the NBA and elsewhere reveals that homophobia is on the wane in the United States. In this age of less-overt prejudice, anti-gay bias has taken a peculiar new form. Those who don’t like the celebrations of Collins’ bravery have countered with aggressive, prideful lack of interest. They don’t say, “I hate this.” Rather, they really want us to know how much they really don’t care. What Limbaugh, Francesa, Brando, and Samuel are asking for is a “don’t ask, don’t tell” policy for athletes. Before Jason Collins raised his hand, that was effectively the rule in major pro sports. Now that DADT is history in the U.S. military, the locker room is one of the few places left where the closet door is still dead-bolted shut. That’s why the “I don’t care” crowd is so foolish, and the “I don’t care” message is so dangerous. Gay athletes have always been stigmatized, forced to live in fear that they’d be ostracized by their teammates or outed on someone else’s terms. As Nathaniel Frank explained in Slate earlier this week, “The closet has harsh consequences to mental well-being and to the cohesion and integrity of a group, both because of the emotional repression it causes LGBT people and the disregard for honesty that it imposes.” The idea that coming out of the closet means “flaunting” your sexuality is, in most circles, a relic of a less tolerant time. But until Collins’ public declaration, the sports world remained trapped in that bigoted past. When someone like Francesa or Samuel says he just doesn’t want to hear it, he’s reinforcing the attitudes that led NBA player John Amaechi to hide his true self until he retired, that had rugby star Gareth Thomas contemplating suicide, and that prevent lots of gay men from trying sports in the first place. What of Asante Samuel’s assertion that Collins needs to pipe down because straight athletes aren’t announcing that they’re straight? Given that Samuel has played in the NFL since 2003, I assume he’s noticed the hot-panted cheerleaders shaking it on the sidelines every Sunday. Maybe he heard about Brent Musburger ogling Katherine Webb in the stands, and cooing that “quarterbacks get all the good-looking women.” He’s probably noticed the million or so times when a TV camera has focused on a player’s wife—a woman sitting in the stands, showing off her heterosexual relationship with the whole world watching. And I’m also guessing he’s looked up at the stadium Kiss Cam, which encourages straight couples to smooch while wringing gay-panicky yuks out of the possibility that presumably straight football players might lock lips. If Jason Collins chooses to “flaunt” his sexuality, then, the 12-year NBA veteran won’t exactly turn the sports world gay. What Collins has done is make it a little safer for the next man to come out. His courageous act brings us closer to making Rush Limbaugh’s dream come true: Hopefully, in a generation, gay athletes will be so commonplace that a player’s sexual orientation doesn’t warrant any attention. And in the meantime, as John Aravosis points out, if Asante Samuel wants to practice what he preaches, he shouldn’t flaunt his sexual preference by appearing in magazine spreads alongside his beautiful wife. Come on, Asante—there are children present.